One of the greatest events in the history of the plate of St George’s Chapel, Windsor Castle was the presentation of the Altar Cross by Queen Victoria in commemoration of her Golden Jubilee in 1887. This was the first time that a reigning Sovereign had presented a piece of plate since the Reformation. The cross was designed by J.L. Pearson and made in London by Thomas Peard. St John, King Alfred, St Louis, St Hubert, Our Lord, St Matthew, St Mark, St Nicholas, St Barbara, St Alban, St Martin, St Cuthbert, St Crispen, St Thomas of Canterbury, St Bede, St Anselm, St Luke, St Edward the Confessor, St Ethelreda, St Margaret, St Edmund, King and Martyr, St Oswald, St Helena, St Hilda, St Edward, King and Martyr and St George. Canon Eastman, Master of the Fabric, reported in the Friends’ Report 1982-83, page 138, that restoration work had been undertaken to the High Altar Cross which had been given by Queen Victoria to commemorate her Jubilee in 1887. He records that the cross was gold-plated on solid silver but that the gilt had become very tarnished over the years and condensation had seriously damaged the internal fittings. 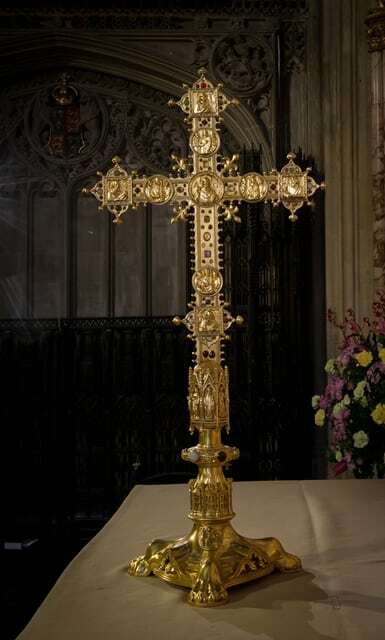 The Cross has been repaired and regilded, and it is interesting to note that when it was removed from the chapel for repair, it was insured for £30,000.